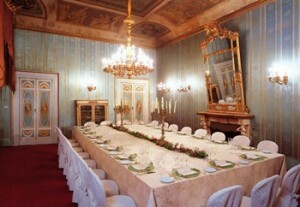 A beautifully decorated XV century Palazzo in the centre of the town. This historical residence is an absolute jewel. It is one of the most important neoclassical palaces in Tuscany and all the monumental rooms still maintain the original decorations: wonderful frescoes, glass chandeliers and red carpets. The entire building is truly astonishing and is perfect for grand events, aristocratic style weddings, ideal for those who wish to amaze their guests. It is also possible to organize Renaissance theme banquets with trumpets, flags, costumes and original XV century dances and music.